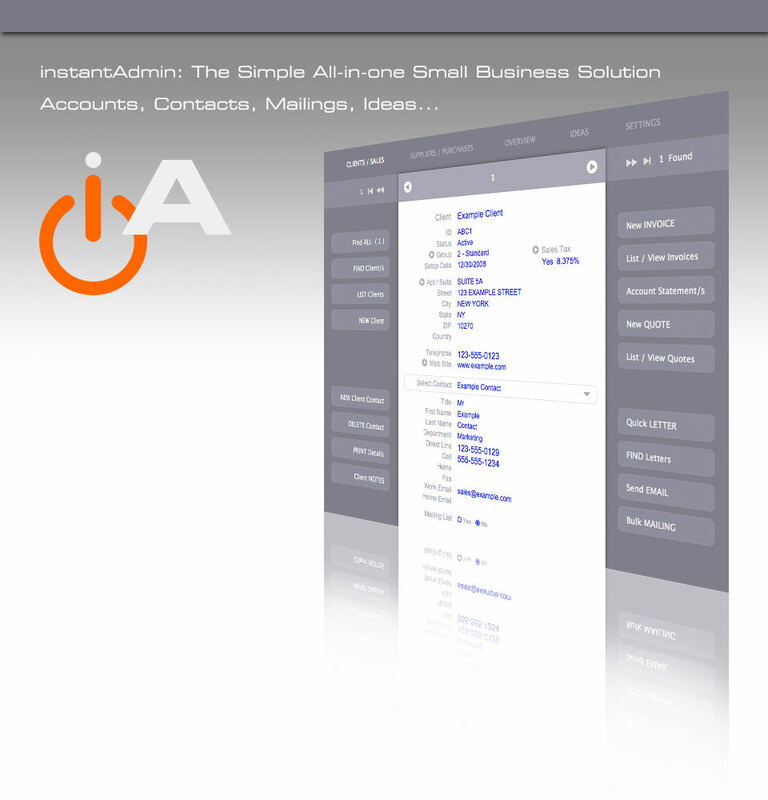 instantAdmin - The Simple All-in-one Small Business Solution for Accounts, Contacts, Mailings and Ideas. instantAdmin is genuinely easy to use business software for the self employed, partnerships and small business which combines elegant simplicity with powerful versatility. We say "Genuinely" because it seems every business accounts package on the market claims to be easy to use, yet we found that not to be the case which is why we originally wrote this software. instantAdmin is not only an intuitive yet powerful accounts package. It’s also a contacts database for clients and suppliers, has a flexible bulk mailing facility and a seriously useful database of notes for your ideas and to-do’s. All seamlessly integrated enabling you to get things done in minutes rather than hours. Both vat registered and non vat registered businesses are covered and you can convert from one to the other instantly. Quick to setup and quick to use: The setup process only takes five minutes and you'll be producing your first Quotes and Invoices a few minutes later. instantAdmin V4 is available for Apple MacOS High Sierra (10.13) with a minimum requirement of MacOS El Capitan (10.11) and Microsoft Windows 10, 8 and 7. instantAdmin is licensed for your use on your own computer for a one time charge. Clients/Sales - The Sales section is built around a Database of your Client / Customer Contacts. Firstly find the Client you wish to deal with, then, at the click of a button, you can create Quotes, Invoices, Letters and Emails relating to that Client. You can also create Bulk Mailing lists and send individually customised Emails or Letters to all of your Customers at once or smaller groups of Customers as required. Suppliers/Purchases - The Purchases section is built around a Database of your Supplier Contacts. Find the relevant Supplier and enter Purchases, create Letters or send Emails to that Supplier. Note: You don't need to find the relevant Supplier for each individual Purchase. Instead you can enter multiple Purchases quickly by selecting the Supplier from a drop down list for each Purchase in the 'New Purchases/s' section. You can also create Bulk Mailing lists and send individually customised Emails or Letters to all of your Suppliers at once, or to smaller groups of Suppliers as required. Overview - The Overview section contains Reports & Analysis for all Sales and Purchases year by year. It covers both 'Accounting by Invoice' and 'Cash Accounting' and calculates VAT returns for either of these accounting methods. Also included is a 'Cost Analysis', which breaks down all Purchases and costs into different categories, and an 'Individual Payments' section which lists all Money Paid In or Out. Ideas - The Ideas section is a Database of Notes for Ideas, To-Do’s and other random thoughts on any subject. They are created with user-definable categories making them quick to enter and quick to find. You can try instantAdmin free of charge for 21 Days. Once you are happy with the product you can buy an Activation Code to permanently unlock the software and continue using it. All data entered during the trial period will be saved for you. Because instantAdmin is only available direct from this website we can cut out the middle man and pass the savings on to you; instantAdmin is priced at £59 inclusive. Taking into account the unique feature set and genuine ease of use you'll find this is a price no one else can match.